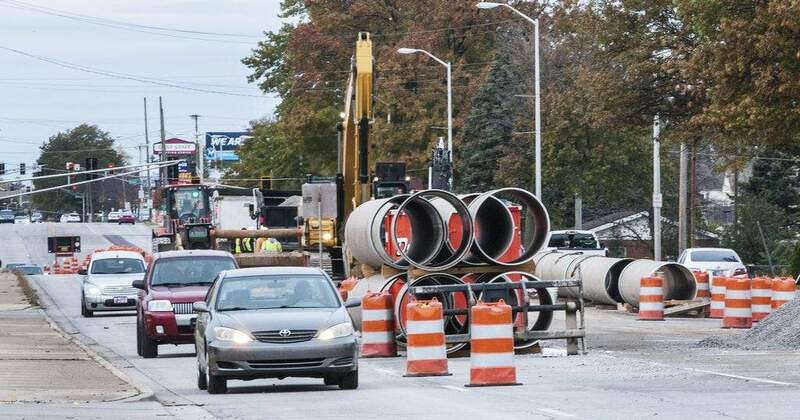 FILE: East State Boulevard between Hobson Road and Coliseum Boulevard was down one lane each way as crews installed a new water line as part of a City Utilities engineering project in 2017. Along Turf Lane Monday, workmen were raking newly sprayed dirt in one resident's front yard, while new concrete sidewalks gleamed in the sun. The Aboite Meadows housing addition in recent months has gotten a makeover -- and, despite the surface trappings, a lot of it was underground, according to speakers at a City Utilities news conference. The event announcing $100 million in storm and sanitary sewer upgrades and water pipes was at a spot neighbors said had flooded in the past. Two held up pictures of the 3700 block of Turf Drive showing it flooded, with water halfway up some vehicles' wheel wells. "I am happy to mention that I no longer have a lakefront property," resident Kuo Karami said during the event. At times, he said, his front yard and back yard at 3707 Turf Lane were flooded. "I was able to watch the entire construction, and I'm very impressed with the efficiency...of the operation," he added. Frank Suarez, public works spokesman for Mayor Tom Henry, said underground improvements are coming to 80 neighborhoods in 2019. Ninety projects have been scheduled, he said.